Samsung announced its 12MP smart camera, the Samsung EX2F, in July, improving on the original Samsung EX1 by adding Wi-Fi capability for easy image sharing and boosting the pixel count from 10MP to 12MP. The Samsung EX2F 24-80mm (equivalent) lens also has an even bigger maximum aperture than the Samsung EX1's optic, pushing up to f/1.4 from f/1.8. This means it has the largest aperture of any compact camera currently available. The larger aperture enables slightly more control over depth of field, as well as faster shutter speeds to be used in low light to help combat blur. However, the EX2F also includes a dual image stabilisation system (optical and digital) to minimise the impact of camera shake. Meanwhile, a built-in neutral density filter enables wide apertures to be used in bright light. Samsung has extended the EX2F's low-light credentials with a 1/1.7-inch back-illuminated CMOS sensor, and by keeping the resolution to a relatively modest 12 million pixels for better noise control. Like most compact cameras, the Samsung EXF2 doesn't have a viewfinder built in, and images are composed on the 3-inch 614,000-dot swivel AMOLED screen, making shooting from a range of angles easier than with a fixed monitor. Samsung has given the EX2F a pretty impressive burst mode, which enables full resolution images to be captured at 3, 5 or 10 frames per second (fps). A Pre-capture option also enables you to record 10 JPEG images taken after the shutter release is half-pressed, but immediately before it is fully pressed. It's useful for capturing the moment after an exciting event. In addition, Full HD videos of up to 20mins long can be recorded in MP4 format. Lower resolution high speed recording at 480fps (192x144), 240fps (384x288) and 120fps (640x480) is also possible for slow-motion playback. The Samsung EX2F is aimed at enthusiast photographers, who will appreciate the ability to use manual, aperture priority or shutter priory exposure modes and the option to record raw files as well as JPEG images. Less experienced photographers, however, may prefer to use one of the Scene modes or the Smart Auto Mode that automatically selects the correct scene mode to use based on the camera's assessment of the scene. There are also fun, creative options such as Panaroma, Magic Frame, Split Shot, Picture in Picture, Artistic Brush, HDR and Creative Movie Maker. Plus there are 15 digital filter effects as well, and a Dual Capture mode, which enables you to record video and 12MP stills simultaneously. 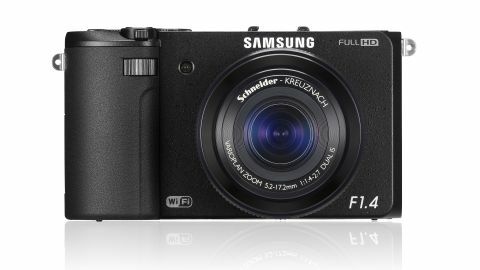 Priced at around £379.99/AU$549/US$449, the Samsung EX2F is in the same sort of price bracket as the Fuji X-F1 and Samsung Galaxy Camera. It's cheaper than some other high-end compacts, such as the Canon G15, Nikon P7700 and Olympus XZ-2.